Yotel is a fantastic exploration into the use of space and creation of atmosphere in the hotel world. We are avid sailors at heart so we love the Yotel look and the obsession with economies of space while not overlooking a single detail – just like a beautiful boat. Indeed, they intuited things we wanted that we would never expect in an economy design hotel like the beautiful and very well appointed bathrooms in every room. This, of course, warmed our hearts to the project instantly! 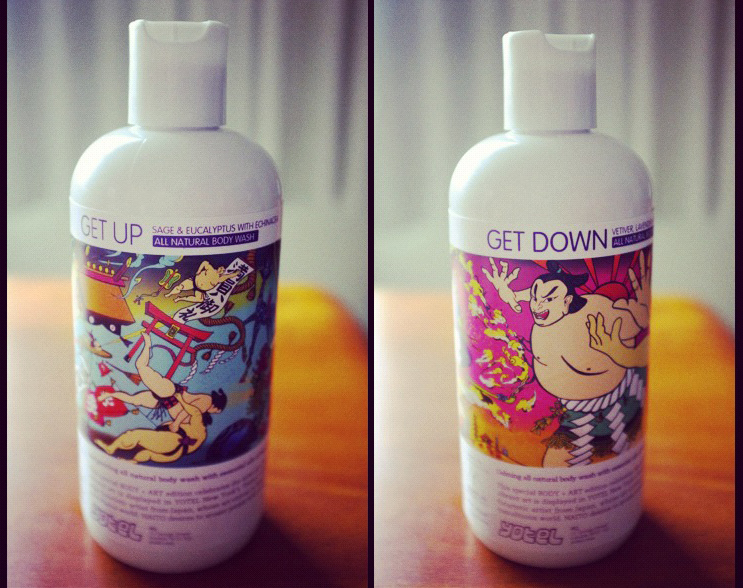 Along with the in-room amenity soaps, shampoo and conditioners we made we also collaborated with Chinese artist Shinpei (who created the murals on the 4th floor in Mission Control area restaurant) to create two awesome collectible RETAIL sized 16oz bottles in PCR PET bottles. GET UP is an awakening blend of Sage and Eucalyptus essential oils with a dash of Echinacea extract to boost immune response. GET DOWN is a delicious blend of Vetiver, Lavender and Rosemary essential oils with a dash of Arnica extract to soothe tired muscles. At Yotel’s request we custom crafted two new products to be made available at retail and for VIP’s. GET UP Sage Eucalyptus all natural Conditioner with Calendula Flower extract and Aloe Vera Juice. ROSEMARY CEDARWOOD & PEPPERMINT LOTION is a rich but light all over lotion.